For this edition of our Cigar Insider series, I spoke with Robert Spoden of Bucanero Cigars. Bucanero was a boutique founded during the mid-90’s cigar boom and, unlike others from that period, Bucanero is still around, currently producing 18 blends. I asked Robert about the founding of the company, why it made it to a second decade when so many others didn’t, and much more. Particularly of note is his take on the effect of smoking bans and cigar taxes on the cigar industry. SG: Tell us a little bit about the founding of Bucanero. What made you decide to start producing your own cigars? RS: Bucanero was founded in 1995 over a couple of bourbons matched with some outstanding cigars and a Costa Rica. The foundation was, and continues today to be, built around honesty and friendship. We set out slowly to introduce unique blends. We avoided the pitfalls of mass production and maintained our focus on quality smokes. Our goal was to enter the cigar marketplace with the strength of blending and aging and let our cigars stand the test of time. SG: Bucanero Cigars was founded in the middle of the mid-90’s cigar boom. Why do you think Bucanero is still around and thriving when so many other companies closed up shop long ago? RS: At the time of the “boom” so many cigars were being mass-produced. So many lacked the essentials of what we believed a fine cigar should be. As a small player in this $5 billion industry we had to decide where to spend our limited resources. Either we would spend the money in advertising or spend our resources in the way we make our cigars. We choose the later, while many others brands started back then were just mass produced cigars to meet the demands of the boom. 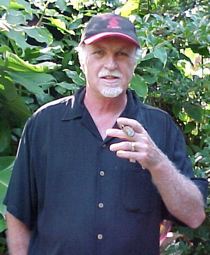 SG: What was the greatest challenge in starting up your cigar manufacturing operation? RS: Trust me it has not been easy. Manufacturing our cigars is truly a science. Everyday the focus on quality must be maintained. What we find tough as a small manufacture is getting the word out about our cigars. It is by far the most challenging mountain we must climb. Our success lies with the cigar smoker who seeks something special. SG: How do you think smoking bans and seemingly ever-increasing tobacco taxes will affect the cigar industry? How do you think the cigar industry has done responding to efforts to tax and ban cigar smoking? RS: We as cigar lovers are all in this together. The laws that keep popping up restricting smoking in public places are not the death blow it appears to be, but the tax bill that is pending is. Cigars can be enjoyed in so many places such as on your deck, fishing, golfing, etc. Even with these smoking bans, we still have our freedom to enjoy our cigars in many other places. The true impact is in the pending tax increase on importing cigars. If this law is ever enacted the effect will be felt by a large group of small- to medium-sized cigar manufactures. For a small importer that imports 50,000 cigars a month, the Custom Duty Tax would increase from $2,350 to anywhere from $50,000 to $150,000 per month. This would effectively change the frequency of smoking cigars for most due to the very high retail costs, in turn effectively driving out of business many cigar retailers. The vast selection of cigars that exists today would disappear leaving only the largest cigar manufacturers’ brands available to be purchased. I will leave it to your readers to determine if the industry has done a good job responding to these threats. SG: In your opinion, what is the best beverage to enjoy while smoking a fine cigar? RS: I enjoy a red wine occasionally with my cigars. But I always smoke my cigar about half way down then I take a sip of my wine. Once the flavor of the wine mixes with the flavor of the cigar you have a synergy of flavor. If the wine mates well with the cigar you should experience a “turbo effect” in flavor. Occasionally I will do this with my favorite scotch or bourbon also. SG: How do you keep cigars in your personal humidor: cellophane on or off? RS: I am somewhat of a purist. I only put one blend in my humidor without the cello wrapper on the cigars. I have always believed the cello dramatically slows down the aging process that Spanish cedar brings to the cigars. By mixing different blends in my humidor over time the cigars take on the flavor profile of the mix. SG: If someone has never tried a Bucanero cigar before, which blend would you recommend as the best cigar to introduce them to the brand and why? RS: Tough question. We produce 18 blends, each with a distinctive flavor. You must consider the strength profile of the blend and match it with the cigar lover’s pallet. If you were at one of our smoker events I could offer to match you pallet with one of our many blends. Many thanks to Robert for taking the time to answer our questions. For more information and to find a Bucanero retailer, please visit Bucanero’s website. I agree that the tax would kill the industry, but he might underestimate the effect of the smoking bans. Perhaps in Florida smoking bans don't effect smokers that much (since they can smoke outside all year) but up in the north I need to smoke in bars during the winter ecause I can't smoke in my house. Living up here in the Minnesota, you're limited when it comes to smoking cigars now here in the winter. It's either in your garage or cigar lounges that are only open until 8pm. Thanks for the article, its always great to read about the little guys in the industry, i'll have to check out some of his sticks. This interview was a pleasure to read. Nice work, Patrick S.
Schip went through so it's only a matter of time before we see just how badly it plays out. Combine that with the economic crisis and nothing looks good for the industry or consumers. Right now I'm looking for the cheapest deal I can get on decent sticks- I like a lot of different things so that is helpful. I'm going to keep as fully stocked as I can in anticipation of worse times… The guy is right- we are all in this together so all of us so-called "alt-smokers" (that one really got me when I first read it) need to stick together- whether its pipes or cigars. Give a thumbs up, share a tale or an ear when we notice each other despite any apparent differences- the plight of the lovers of real tobaccos is the same! I just came across this fine company a couple of months ago. My big humi now sports about 50% Bucanero blends. Not only do they make great cigars a low price point, but the service is excellent. They often will add a hand written note and a couple of free smokes with each order. The Clasico Maduro, the Douglas, Windjammer and Canon are my choices. I first smoked a bucanero at Mr. Spodens home in 2002..excellent smoke and a great host. Thak you Robert ! !